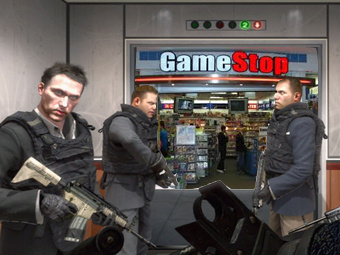 Two guys with semiautomatic firearms were hellbent on breaking street for Call of Duty: Black Ops, sticking up a Baltimore-area GameStop and looting it of 100 copies of the game, due out Tuesday. The Harford County, Md. sheriff's office said the heist happened Saturday evening, and the robbers waited until closing time to hold up the GameStop in the Festival at Bel Air shopping center in Bel Air, about 30 miles northeast of Baltimore. Deputies said two customers stopped by the store mid-robbery and were forced at gunpoint into a storage area. Neither they nor employees were hurt. The robbers might also be behind an Oct. 21 holdup at GameStop's nearby Aberdeen, Md. location. A sheriff's office spokesman asked locals to call them if they're offered a copy of the game before Tuesday's release date. A quick scour of Craigslist in that area turned up no such offers. That brilliant 'shop was done simultaneously by readers Amoliski and Yashinu.